We’ve all been waiting so long for this songbook/CD – how wonderful that it is finally available! Mary has collected some of the best work & play songs that any child could hear of sing. 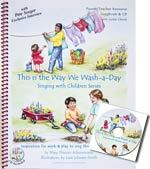 Her crystal clear, soft voice carries any adult along as you learn them to share with the children in your life. Pete Seeger’s contribution to this wonderful collection is an almost-too-good-to-be-true addition – yet another inspiration to ‘make a joyous noise’! 52 pages, 8 1/2″ x 11″, Spiral Bound. Includes Audio CD.